Farmers' Clubs - Planet Aid, Inc. Many farmers in developing countries live at the subsistence level. This means that they grow enough to barely survive, and are unable to rise above conditions that keep them in poverty. Moreover, they rely on traditional farming practices that are leading to lost productivity given the frequent droughts and other challenges imposed by climate change. To help subsistence farmers find a path out of poverty, Planet Aid supports the Farmers’ Clubs development program. There are Farmers' Clubs projects ongoing in Brazil, Belize, the Democratic Republic of Congo, Ecuador, and Zimbabwe. Past projects were implemented in Guinea Bissau, South Africa, and India. Planet Aid has also previously supported Farmers' Clubs in Malawi and Mozambique through a partnership with the U.S. Department of Agriculture and in-country implementing partners ADPP Mozambique and DAPP Malawi. Farmers' Clubs is a three- to five-year program that trains farmers in sustainable farming methods and introduces them to new ways of value-chain processing and marketing. The program centers on inspiring farmers to embrace opportunities to improve their lives, providing them with the means to experiment with new techniques and empowering them to rise from poverty. The best practices used by the Farmers’ Club Program to accomplish these objectives fall into three primary categories: 1) provide farmers with the necessary training to improve methods and offer opportunities to learn by experience, 2) organize farmers into sustainable clubs and cooperatives, 3) offer small grants of equipment and introduce a sustainable system of livestock pass-on grants. Simeon Kampala is 49 and farms in the Lilongwe Rural District in the sub-Saharan country of Malawi. Like many of his peers, Simeon has practiced traditional farming, growing corn and tobacco and struggling to feed himself and his family. 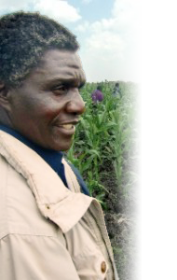 In 2007, Simeon heard about a new program in the area called Farmers’ Clubs, which was bringing new conservation farming methods and other skills to help improve the situation of growers like himself. “I learned many things from the demonstrations, and I knew that if I did the same thing on my land it would mean much more production and income for my family,” he said. Trained agronomists and other professionals facilitate training sessions. The training emphasizes "conservation agriculture" (an ecological approach that emphasizes natural inputs and strategic water management) as a method to obtain higher yields. Farmers are able to experiment with the new techniques on a shared "experimental plot." Upon observing the results first hand, they are more likely to invest in a technique and apply what they have learned to their own fields. The program also recognizes that agricultural development does not occur in a vacuum and that farmers need support in other areas of life that can affect their livelihoods. Participants thus also receive training in health and hygiene, family economics, and HIV/AIDS prevention. Partnerships with local organizations constitute an important part of Farmers' Club, ensuring that the program maximizes impact through widespread support and cooperation. Such partnerships also help facilitate links that farmers need to regional and export markets. Partners in these projects include the ministries of agriculture in each country, private sector companies, and organizations that provide low-tech solutions for sourcing irrigation and other agricultural materials.